Build a huge network of support for women by showing your commitment in finding a cure for breast cancer. Show off your never ending fight to put an end to breast cancer once and for all every time you use this Athletic Dpt. Sports Bag. Our Sports Bag is made of 12 oz. Canvas with a Cinch Closure. Measuring 14" x 18" x 2". Each Custom Sports Bag is made especially strong to hold your important essentials with a drawstring top closure. Our breast cancer bags include free personalization of any name. Have to go to treatment every 3 weeks forever because my cancer metastasized so I can pack my bag and just leave it packed. Just grab it and go. 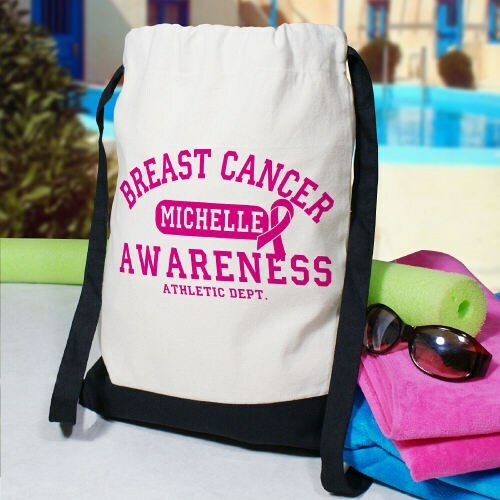 Additional Info This Breast Cancer Awareness Sports bag is a great gift. Show your support while using this sports bag at the grocery store or anywhere you see fit. MyWalkGear.com has many great Breast Cancer Awareness Apparel & Walk Gear for your Awareness Event needs. You May also like to show your support for the person you’re walking for with our Breast Cancer Awareness Long Sleeve Shirt and our Breast Cancer Awareness Hoodie as well.